Dey Street Books, 9780062293299, 272pp. Toni Braxton has won six Grammy Awards and sold more than sixty million records worldwide. Her hit song "Un-break My Heart" still stands as the number two all-time bestselling single by a female recording artist. Currently, she is the star of the WE tv hit reality series Braxton Family Values and the new Lifetime original movie Twist of Faith. Braxton was the first African American woman to play a leading role in a Disney Broadway production when she starred as Belle in Beauty and the Beast, and she has headlined in one of the top ten Las Vegas shows of all time. 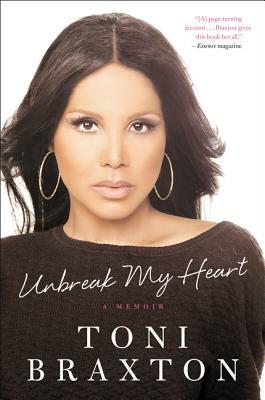 Toni is a passionate advocate for both Autism Speaks and Lupus L.A.
Braxton recounts her struggles candidly... It’s the reflective, positive tone that makes this tell-all intensely readable. For fans who loved her in her heyday or recently found her on her reality show, Braxton Family Values, this is a must-read.